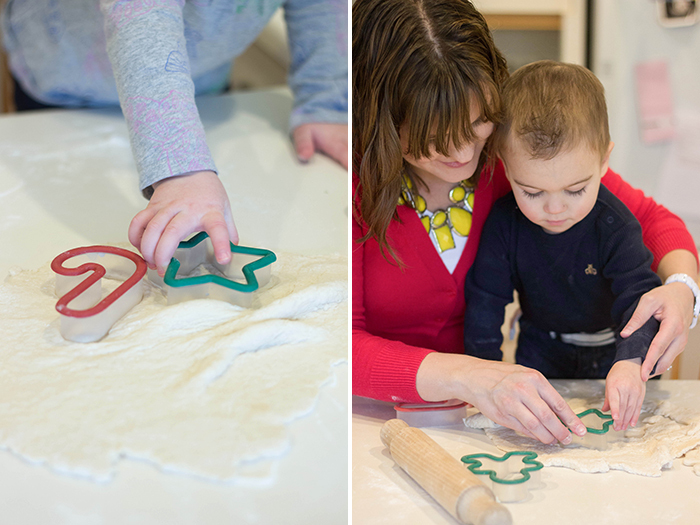 Today we have an awesome holiday recipe from Melissa over at So Festive! “Hello there! My name is Melissa, but you can call me Mel. I blog over at So Festive!, a collection of all things festive for holidays, parties, and life. I’m a big fan of traditions and today I’m going to share one of my favorite holiday traditions with you. Have you ever heard of beignets (pronounced “bin-yays”)? If you haven’t, don’t worry because most people haven’t. My parents discovered these delicious french doughnuts at Cafe du Monde in New Orleans years ago. They fell in love with them and decided to make them for us every Christmas morning. 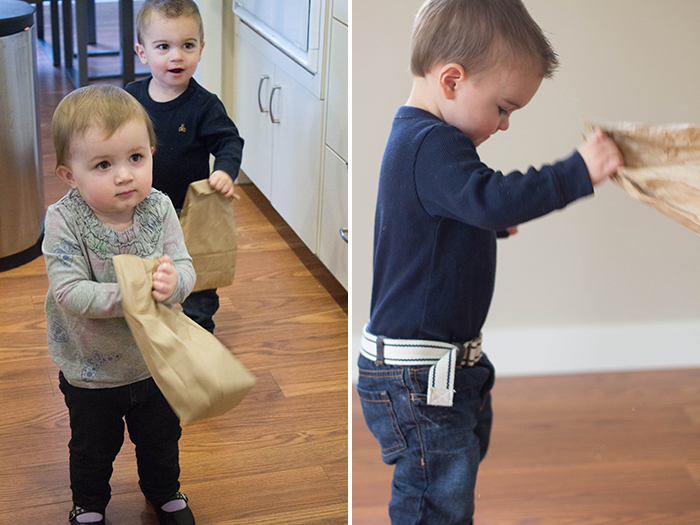 Today I’m going to show you how fun they can be to make with your kids. Ready? Let’s go! 1. 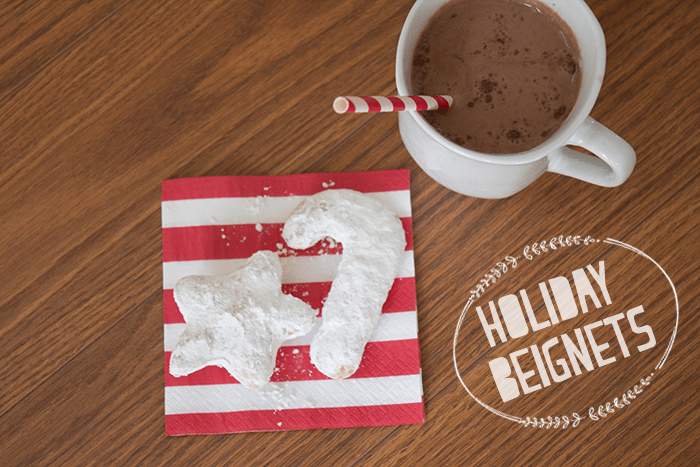 Here’s what you’ll need: Beignet mix (can be purchased online , at World Market for $4 per box, or try the from-scratch recipe here) mixing bowl, water, rolling pin, holiday cookie cutters, paper bags, oil for frying and powdered sugar. 2. Combine 2 cups of mix and 7 oz of water in a mixing a bowl (for each batch). 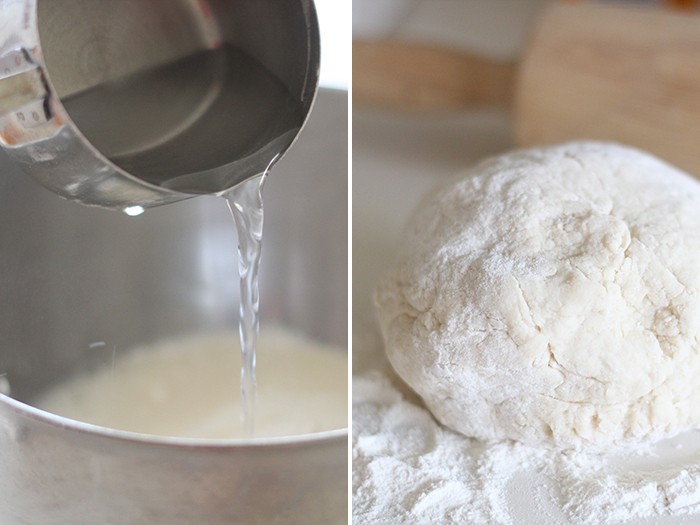 Stir until it is a soft, pliable dough. If it’s too sticky, add a little more mix. If it’s too thick, add a little more water. You can’t mess it up! 3. 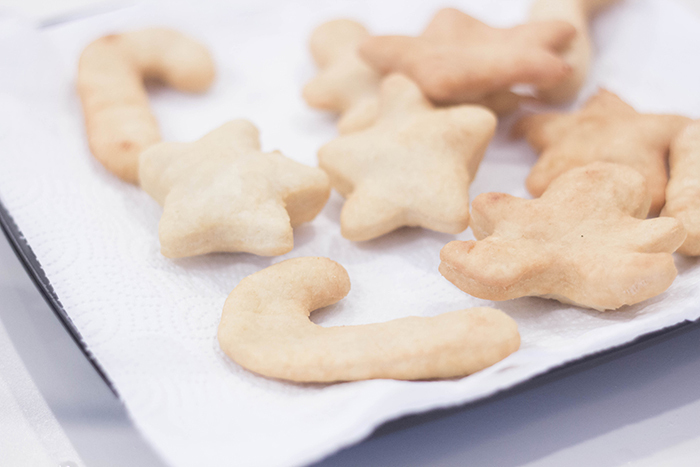 Put the dough on a floured surface and roll it out to 1/8th inch thickness. 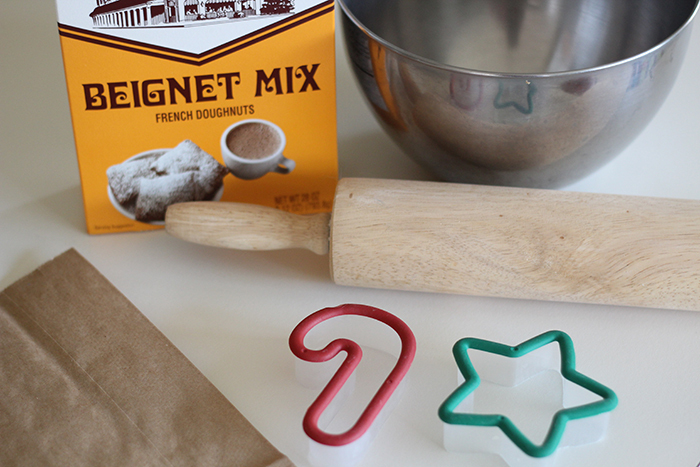 Use holiday cookie cutters to cut the dough. 4. Put each beignet in hot oil and fry until each side is golden brown. 5. Let the beignets drain on a paper towel. 6. 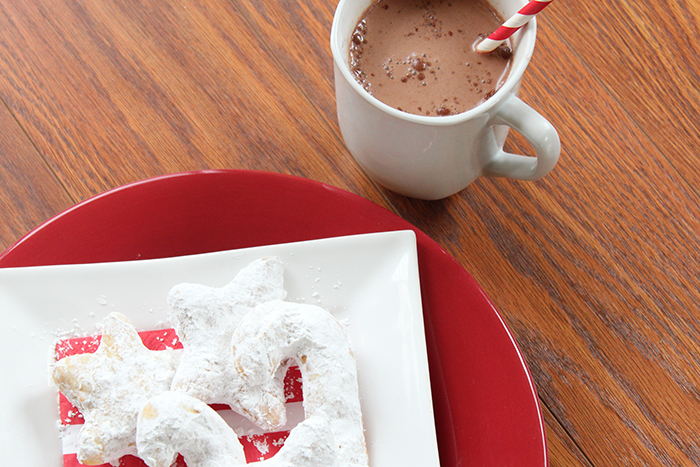 Put them in a paper bag with a few cups of powdered sugar and let the kids shake, shake, shake! Doesn’t that seem so easy and doable? And with so many steps the kids will love. We’re excited to try this one out! For even more festive holiday ideas, follow So Festive on Facebook, Pinterest, and Instagram. We hope you had a lovely Thanksgiving! 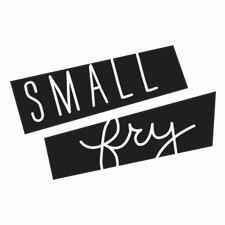 We have so much we want to share this upcoming month we decided to postpone our typical Fryday posts until the New Year so we can cover it all! If you need a consolation, we have a pretty killer Instagram giveaway going on this morning! Hint: #blackFRYday. Happy weekend, everyone! I love it when I see new to me recipes that are out of the ordinary. Can’t wait to try these! Pingback: So Festive! 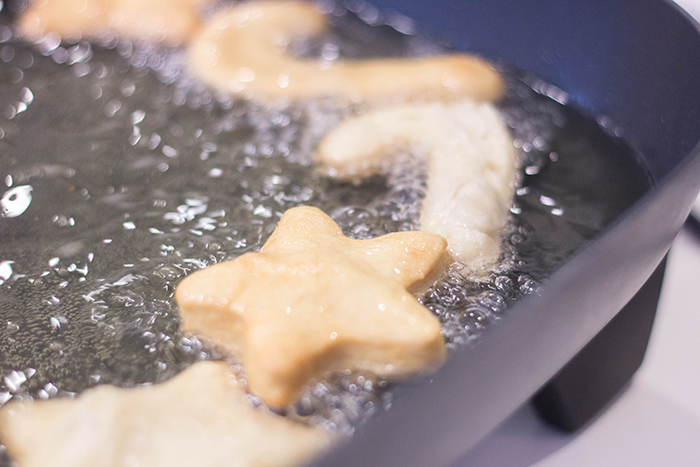 » Blog Archive How to Make Beignets » So Festive!